Beginning in 2019, the Board of Trustees of Summit Downtown, Inc. (SDI) offers its new Façade Grant Program, funded by SDI. 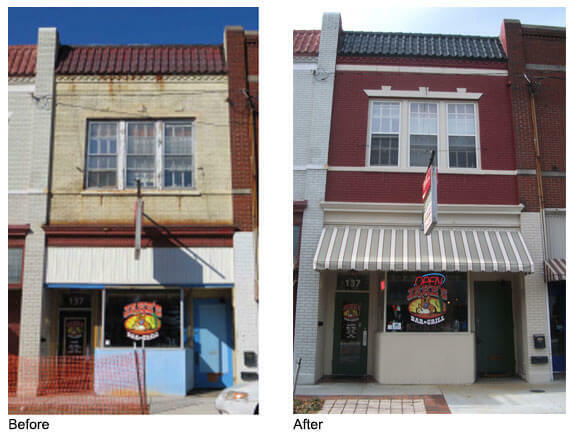 SDI considers the Façade Grant Program an incentive for businesses to improve their storefronts with new awnings, signs or other improvements. Storefronts that are in disrepair or otherwise unattractive have a negative impact on the whole downtown, therefore SDI has decided to help improve those properties with the grant program. Last year, SDI created a Design & Beautification Committee to focus on visual improvement projects on public and private land in the downtown district. This grant program was created to help incentivize businesses whose storefronts could use a facelift, which would help their business and also help the downtown. The grants are for a maximum of $2,500 and require a matching contribution by the business. For example, if a project costs a total of $1,500, the grant would be for $750; if a project is $10,000, the grant would be the maximum amount of $2,500. The goal is to be able to offer them to several businesses each year the program is in place. The Facade Grant Guidelines and Application can be accessed here: Guidelines and Application. For more information or any questions, contact Nancy Adams at [email protected] or 908-277-6100.